Our clinic uses both intra oral and extra oral state of the art Kodak digital xray systems. We also own a Sirona Galileos 3D cone beam CT used for accurate diagnosis and treatment planning for dental implants. Safer – Allow you to get necessary care without unnecessary radiation. X-rays play an invaluable role in the diagnosis of dental problems but many people are concerned about the exposure to x-ray radiation. Digital x-rays eliminate these worries because they require approximately 90% less radiation than conventional film x-rays. Better – More accurate than conventional x-rays and reveal things film can’t. The digital computer image can be magnified over 300x its normal size, making it easier to see where and what the problem is. 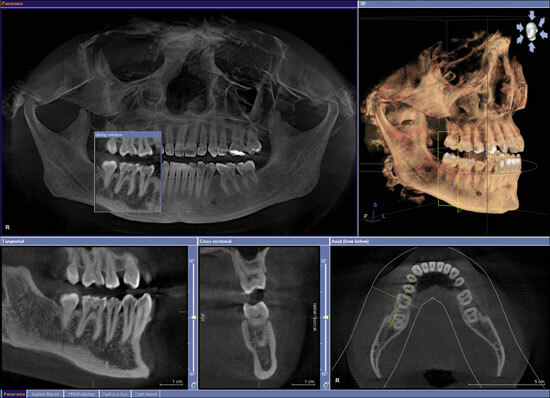 The digital x-rays can also be manipulated to correct contrast ratios and even color-adjusted to reveal hidden problems. If necessary, images can be electronically sent to a specialist to determine an appropriate course of action. Faster – Your dentist is able to spend more time treating and less time processing because the digital computer images are instantaneous. Unlike procedures a decade ago, no time is wasted processing and mounting x-ray film. Smarter –There is no harmful waste. Our x-ray system does not use film or chemicals, so we don’t have to worry about disposing of hazardous processing waste, which is better for the environment. As a patient, you get safer, better, faster, smarter service without the usual increase in price. It’s just another way that we have been able to go above and beyond in providing our patients the very best in dental care.